The Barcelona Chair was originally designed by Ludwig Mies van der Rohe in 1929 to represent Germany (Bauhaus) at the Barcelona International Exhibition. 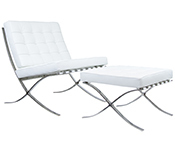 The Barcelona Chair was a centerpiece offering the king and queen the beauty and comfort of modern design. The Barcelona Chair has become one of the most iconic chairs in modern furniture history because of its timeless, elegant design. Mies van der Rohe created the chair as a symbol of the traditional beauty seen for royalty and combined it with simple lines that could be easily produced for the common man. 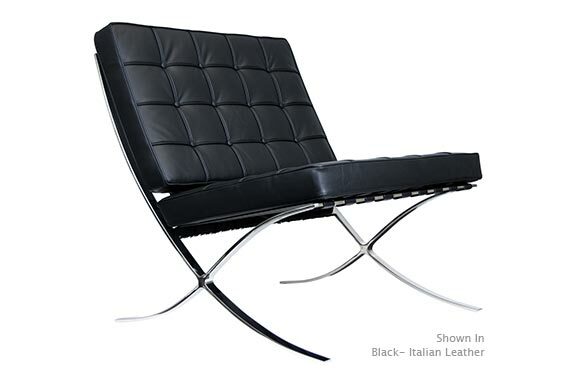 The Barcelona Chair uses modern materials for the steel and luxurious, leather for softeness. 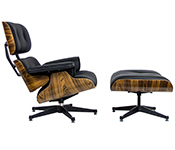 Original Barcelona Chair produced by Knoll to original Mies van der Rohe specs. 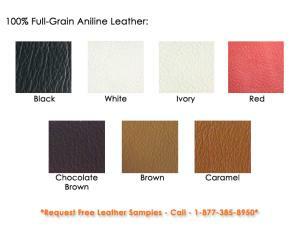 Spinneybeck® or Edelman Leather cowhide. Hand-finished, artisan-tanned hides. 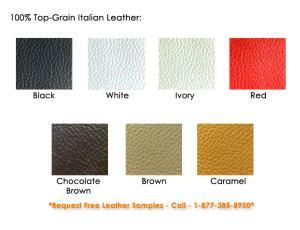 Edelman leather collects and finished the finest full-grain leather in Europe. There is no doubt to the luxurious feel and look of these fine leathers. Good for high-traffic areas. Resistant to stains (grease,grass, coffee, wine, crayons), Greenguard indoor air quality certified. Bar-stock steel frame with hand ground and hand buffed chrome finish. This chromed-steel frame shows no welding marks for one streamline support system. Ludwig Mies van der Rohe was one of the fathers of the modern industrial design movement during the 20th century. He served as the final director of the Bauhaus, and his modernist approach is seen in the skylines of most major cities of today. Mies van der Rohe was known for the saying "less is more" and this preference for a minimalist approach epitomized his design, as he favored steel and simplicity over the traditional ornate styles that had come before.